There have been many well-known people who have passed away in 2016, but one death that hit me harder than others was the death of Carrie Fisher, who passed away today, December 27th. 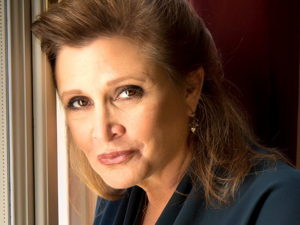 It wasn’t just Ms. Fisher’s turn as Princess Leia in the Star Wars franchise, her brilliantly written Postcards from the Edge, her hilarious portrayal of a group therapy leader in Austin Powers, her appearance in the one-woman show Wishful Drinking…and many other contributions to stage and screen that touched many of us in the mental health community. It was the fact that she spoke out about having bipolar disorder and being a recovering addict when not many public figures were doing so. Ms. Fisher was so open about having bipolar disorder that she even spoke about her family’s mental health history in her stage show Wishful Drinking, complete with a blackboard chart of all her family members and a pointer stick. It was refreshing hearing a public figure speak about her psychotropic medication the way it should be spoken about – openly and plainly. People take medication for brain issues just like they take medication for diabetes and high blood pressure. Why should psychotropic medication be treated about any differently than other medications? Ms. Fisher made it acceptable to talk about mental health issues, and even embrace them as part of you. Her talent as a writer helped many have words for what they were and are experiencing. 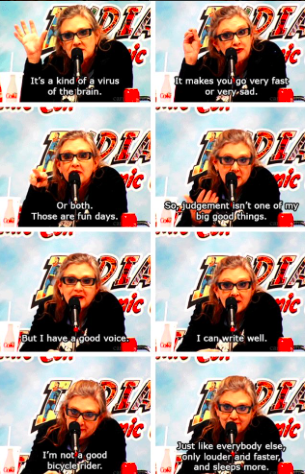 Ms. Fisher was a survivor. She owned her bipolar disorder and addiction issues – and the mental health community is better off for it. Rest in peace, Ms. Fisher. My condolences to her family.